Alley Cat Books on 24th Street. In 2014, Simon Crafts and his fellow employees thought the old-fashioned school desk displayed in the window of Alley Cat Books, on 24th and Treat, looked a little lonely. They put up a sign that read “Writer in Residence Wanted.” It was meant as a joke, although every so often someone would drop by with questions about filling the position. This continued until Crafts and the others started taking the idea seriously. “We were like, ‘Maybe we should do that,’” he said. So the bookstore employees created an application. Alley Cat has been running its six-month writing residency ever since, mostly as an informal, word-of-mouth opportunity, Amy Berkowitz, who manages the program, explained. Their most formal outreach were signs taped in their window. When people asked about it at the front desk, employees handed out hard-copy applications. The selected writers started sitting with their laptops in the gallery at the back of the shop. Recently, Alley Cat has taken steps to formalize the program by promoting it on its website and moving the application process online. It’s an attempt to make the program known to the broader public and to grow the application pool. Berkowitz said the change has yielded exciting results. The three new residents, selected from a pool of 33 applicants, will begin their stint in July. Finding a writing residency in a bookstore is uncommon, but not unheard of. Paris’s independent, English-language Shakespeare and Company announced on its website it has let over 30,000 travelers— called “tumbleweeds”—sleep in the shop in exchange for some light work and a one-page-long autobiography. Closer to home, Bookshop Santa Cruz sponsors a two-week writing retreat in the Santa Cruz Mountains. 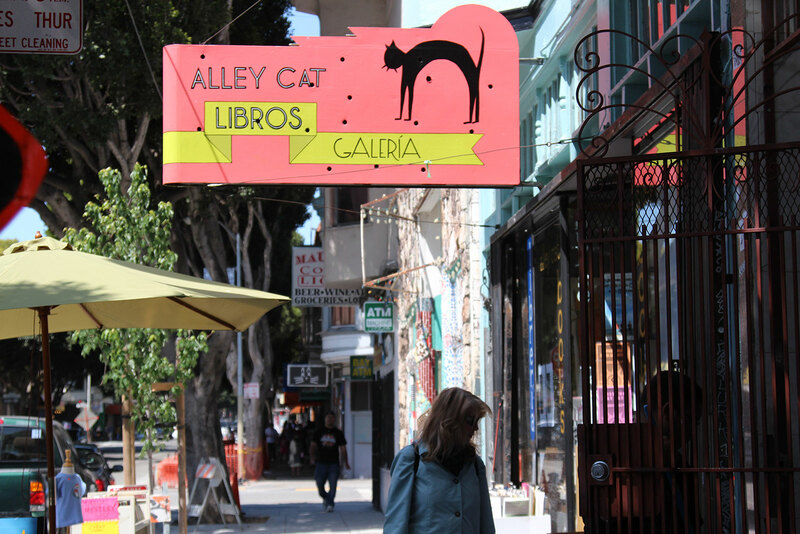 Alley Cat’s program doesn’t provide housing or funding, so while Shakespeare and Company’s tumbleweeds come from across the globe, Alley Cat’s program is geared toward local writers. What it offers is structure, a notebook, heavily-discounted books (the biggest perk, in Berkowitz’s opinion) and a place to write in the shop’s gallery. During the six-month stint, each resident produces a chapbook and ends the program with a reading of their works. The writers can station themselves wherever they would like in the public gallery space, which the store also uses for its events, Alley Cat employee Carolee said. Most writers choose to sit at a round table near a shelf of zines and records, behind a rack of sticker books. Carolee has also seen them set up shop on the gallery’s tiny stage. “It’s a lot like being at a coffeeshop,” Berkowitz said. Berkowitz, one of the first residents in 2014 — was drawn into the shop because her boyfriend at the time noticed the sign in the window — remembers the charm of the public work space, where she sometimes fell into conversations with book browsers. Other times, when she needed information, the store became a resource. Once, she wanted to reference the content of a Works Progress Administration mural she only vaguely remembered, so she went over to the art section and found a book of WPA art. The residency helped her complete her book, “Tender Points.” It’s a lyric essay about fibromyalgia, a chronic muscle pain disorder, and the various forms of women’s trauma. Now that Berkowitz is helping run the program, she is happy to offer the experience to a more diverse group of writers, starting with, she joked, writers the Alley Cat employees aren’t already friends with. The fall residents, who are starting the program that runs from July to November, are Leora Fridman, the author of the poetry collection “My Fault,” as well as five chapbooks, and the recipient of several writing fellowships; Vicente Viray, a graduate of the University of San Francisco’s MFA program whose stories have been published in numerous journals, including “The Greensboro Review,” “Mary: A Journal of New Writing,” and “California Northern”; and Chrissy Anderson-Zavala, who has taught writing at UC Berkeley’s Early Academic Outreach Program and served as interim manager of the WritersCorps program. Her poem, “The Cross,” received a Pushcart Prize nomination in 2011. Excellent! Alley Cat also hosts/co-hosts many public readings each month. I’ve read my stories several times, and I’ve also been a frequent attendee. The events are well-attended and the programs well-presented. It is a special place. Kudos to Kate Rosenberger for yet another contribution to the literary life of our city, despite it’s rapid decline into crass consumerism and homogenization. I remember dropping a power cord out of our window when her lights went out downstairs. Go gurrl.